Microway’s QuadPuter servers provide significant compute power, memory and storage within a single system. Whether used as a stand-alone server or part of a cluster, the Navion QuadPuter is the SMP server of choice for academic, commercial and government research labs. Symmetric Multi-Processing (SMP) effectively combines several computers into a single server. Microway’s Navion QuadPuter provides four AMD Opteron processors on a single motherboard. This lowers inter-processor latency while increasing bandwidth, thereby improving the performance of fine-grained parallel applications (such as those using MPI or OpenMP). Many of our customers use QuadPuter in lieu of a compute cluster, eliminating the administrative tasks required to keep a cluster running. These customers have been able to replace groups of older machines with a single QuadPuter. Users with demanding requirements have commissioned powerful, cost-effective compute clusters built from QuadPuter servers. Our 2U QuadPuter is available with 64-bit Linux and/or Windows operating systems. Each is custom-configured to your exact specifications, including large memory, large storage, GPUs and high-speed networking. The larger expansion card area provides other possibilities, such as flash storage (SSD) or FPGAs. Need more compute power? 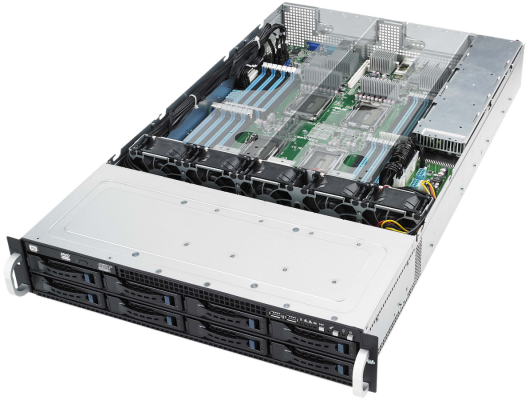 Any of our Navion servers can be linked together for a cost-effective HPC cluster.